The past few days got me reminiscing about those happy moments and even just thinking about how much fun we had makes me smile. It could be that I am easily content or that I am simple-minded. But just receiving your text messages would easily make my day too. Imagine what would happen if you call me. Maybe I’d faint from the high levels of delirium running through my veins. Haha! Ever since that night few years ago when in the middle of our regular text conversations you told me you wrote “ITETTYATSAEOE” in your diary, my heart was yours because I felt the exact same way. I have probably told you long ago that I always have this stupid grin on my face whenever I talk to you and how you always make me smile stupidly in public or how I always have to stop myself from laughing out loud when there are people around. I love talking to you and sharing the events of my day with you so much that my day only feels complete when we surprise each other with happy texts in the morning, random texts throughout the day and wish each other “goodnight and sweet dreams” at night. 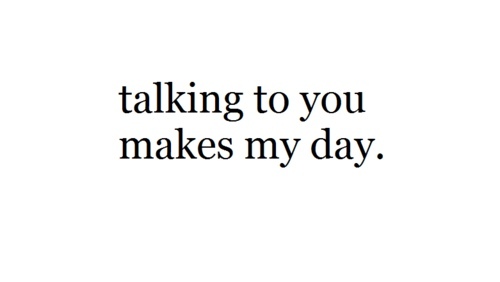 There are never bad days when I talk to you, only good or awesome ones. The writers from How I Met Your Mother must have had a similar experience because in one of the Season 7 episodes, a scene gave what I felt a voice. And it’s so true… For me at least.